Published in 1865, Lewis Carroll’s Alice’s Adventures in Wonderland was the most time consuming, yet important project of John Tenniel’s career. Though Tenniel created a fresco for the Houses of Parliament in 1846, and worked on other projects prior to working at Punch Magazine, his political cartoons and illustrations for Carroll’s stories are what made him a household name and earned him a knighthood. The working relationship between Carroll and Tenniel was tumultuous, with both men being very particular in their habits and personal tastes. Carroll critiqued Tenniel’s art (initially, he only liked one of Tenniel’s proposed illustrations for Alice’s Adventures in Wonderland) and Tenniel shared his often critical opinions of Carroll’s writing. In the end, Alice’s Adventures in Wonderland was a great success, and Carroll was commissioned to write a sequel, ideally with Tenniel as the illustrator. 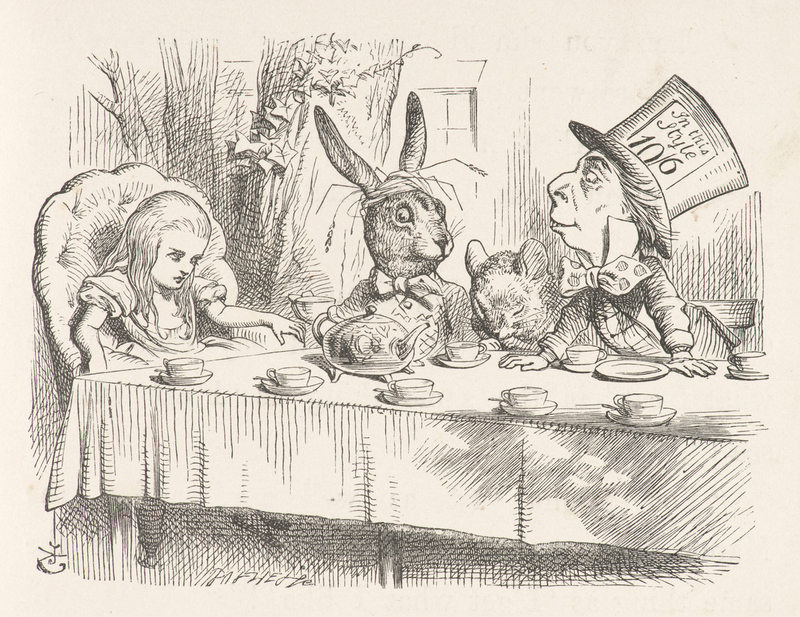 The illustration of “The Mad Tea Party” has become one of the most recognizable from the book, and the characters are some of the most beloved in children’s literature. Alice sits at the head of the table while the March Hare, Dormouse, and the Mad Hatter squeeze in at one corner alongside her.